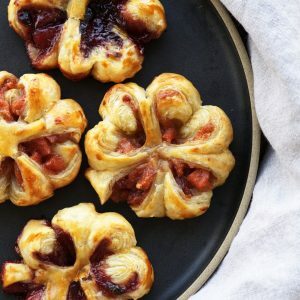 These 3-ingredient pastry flowers are ridiculously easy to make, and are sure to impress your friends at your next brunch or tea. These 3-ingredient pastry flowers are ridiculously easy to make, and are sure to impress your friends. Use your favorite jam, or try my recipe for cardamom quince jam! Unfold your pastry sheets. Cut each sheet into 9 squares. Spoon 1 tbsp of jam onto half of the squares. Cover each of these squares with one of your non-jammed squares. Pinch the sides. Repeat for the other 8 jam squares. Take a jam-filled squares and place it in your palm. 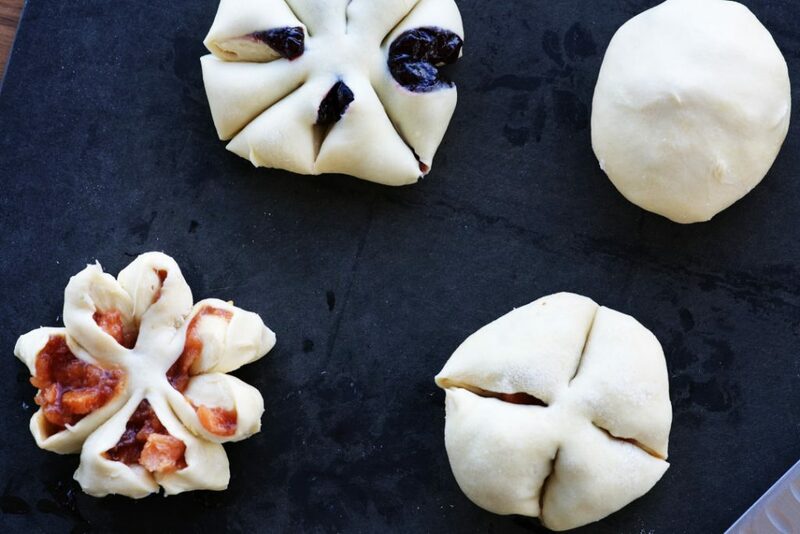 Pinch together the 4 corners to create a dough ball, filled with jam. Place pinched side down on a cutting board. Repeat for the other 8 squares. Cut 8 petals in each pastry ball. I like to cut 4 first, 90 degrees apart (keeping the center in tact of course) and then the other 4 cuts are easy to cut evenly. Take two adjacent petals and twist them away from each other…the right petal will twist clockwise and the left counterclockwise. Continue for the other 3 pairs of petals. Transfer to a baking sheet. Repeat for the other 8 flowers. 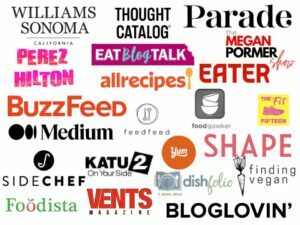 6 max per baking sheet. Bake 18-20 minutes until golden brown rotating the baking sheet half way through. How do I defrost the puff pastry? I love keeping puff pastry dough in the freezer. I leave it in the refrigerator overnight, then finish defrosting at room temperature for about 30 minutes. You’ll spend about 10 minutes in the morning prepping these, 18-20 minutes in the oven, and the whole house will spell just incredible. It’s like heading over to your favorite boulangerie without having to leave your house! Now that’s my jam! 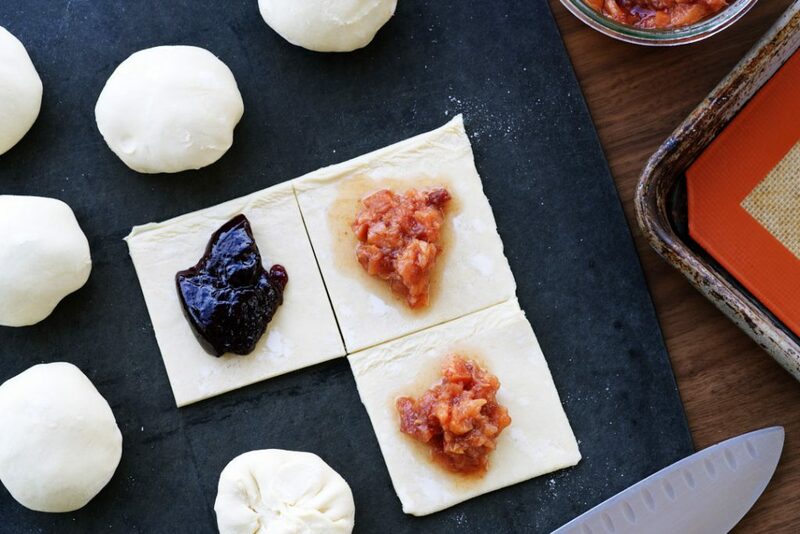 After cutting your puff pastry sheet into squares, fill them with some jam, pull the 4 corners of the square together, and pinch until sealed. Whatever it is…you’ll love this recipe. Also, I’m using my cardamom quince jam…recipe here! Take each pastry pouch and place them seam side down. Cut 4 slits in a t-pattern without going all the way to the center. Then cut 4 more, one in between each of the original 4. Then twist each segment. Here is my favorite baking sheet. The light aluminum is ideal for baking. However, I use heavier metal for savory baking/roasting. 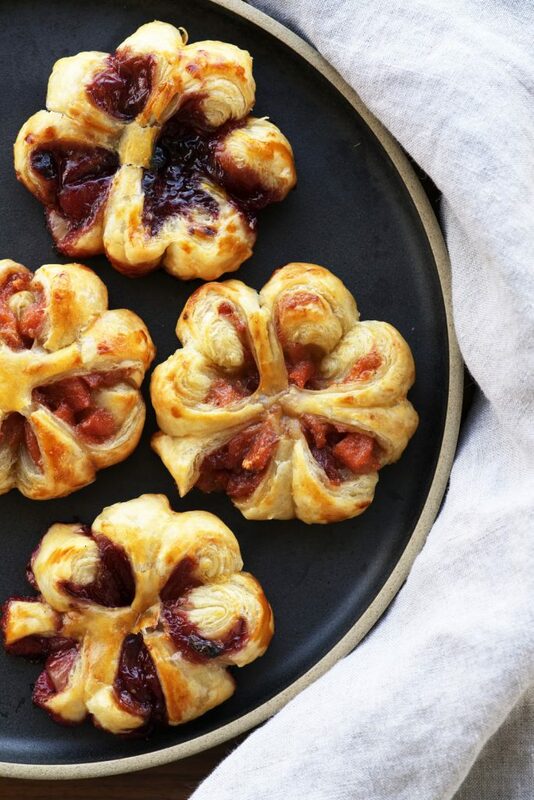 How to guarantee you will love these 3-ingredient pastry flowers! My favorite thing about this recipe is you can use any jam you already have at home. That way, you already know you’re getting a flavor you like. My favorite jam to use is my cardamom quince jam, but as you can see in the photos, I also used my partner’s favorite mixed berry jam. 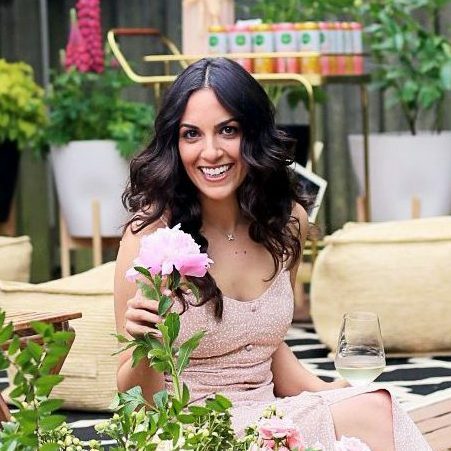 Have guests? 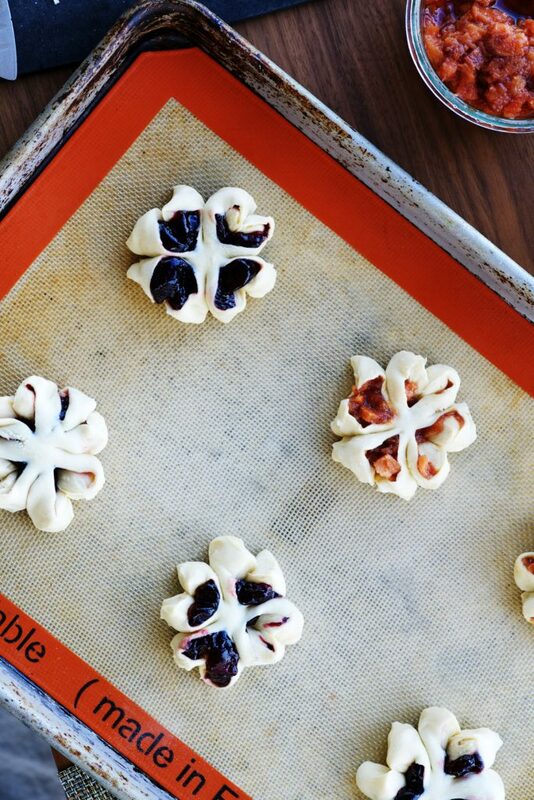 Ask them what their favorite jam is and use that flavor in these 3-ingredient pastry flowers! Place each puff pastry flower on your baking sheet, leaving ample room. Some jam will spill out during baking, so make sure your baking sheet is lined with a silpat or parchment paper. Looking for more sweets? Then check out more desserts and sweets here. Previous Post: « Veggie Dumplings – w/ANY veggies in your fridge!